← A Norfolk Clergyman Takes The Grand Tour—Twice! An account from the Norfolk Chronicle of an election riot in Norwich. I’ve noted before that Norwich elections tended to be turbulent, especially towards the end of the 18th century. However, this one seems to have drawn in nearly all the more important people attending. Note that being drunk at the time was seen as sufficient mitigation to cause any charges to be dropped! 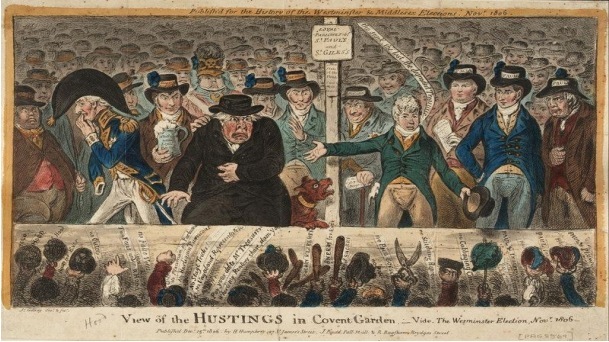 The Poll commenced at about nine o’clock on Friday morning and was continued assiduously and without interruption till about five in the afternoon (at which time poll was considered by most people as decidedly in favour of Mr. Hobart), when a desperate fray took place between the staves-men of the contending parties, which was evidently occasioned (as the writer of this paragraph was an eye witness to the transaction from the beginning to the conclusion) by the displeasure of the staves-men of the unsuccessful candidate at the exultation of those of the successful one. Sir Thomas Beenan’s men advanced out of the bravado and with a threatening attitude, beyond their due bounds; this was resented by the opposite party and a mutual defiance was followed by a mutual exchange of blows, which seemed to be given with a hearty good will: several men were knocked down and very much wounded on both sides; but we are happy to relate no lives were lost. Amidst the confusion some imprudent person at a chamber window of the Kings Head, under which the tumult began, gave offense to Sir Thomas’s party by repeated scoffs which caused one of them to throw a piece of broken staff at the aggressor who rashly returned the assault by throwing an empty glass bottle which unfortunately fell on the head of a spectator who was standing watching the riot and terribly wounded him. This inconsiderate action was comparatively, adding fuel to the fire: for now Sir Thomas’s men attacked the windows of the Kings Head and entirely demolished the glasses of most of them that were within their reach with stones, glass bottles, broken stones, and whatever else they could come at; the violent assault was returned on the assailants by the antagonists, and now each party to divide by mutual consent, and a different war was carried on by such kind of missile weapons as they could lay their hands on; the stones of the street were torn up and hurled with a most savage fury. At about this period of the riot, the Sheriffs in order to suppress it went with the Hon. Wm. Windham. Mr, Cha. Honney-Steward, Mr Alderman Pontridge and other gentlemen and as many of the posse as they could collect onto the neutral ground. At this point Mr. Hobart’s staves-men had fled or been driven to a considerable distance from the chain. Whilst the Sheriffs and Gentlemen with them were using their endeavours to restore peace amongst Sir Thomas Beenan’s men, one of them knocked Mr. Sheriff Pattison, who, as soon as he recovered himself, seized the man and took him to the Hall where he was taken into custody, but it appearing that the man was in liquor at the time and of a pretty good character the Sheriff consented to his release. The riot gradually subsided and was all over in about an hour, but it was adjudged expedient to adjourn the poll to the next day. I’m not surprised the election was adjourned. Still, polls were sometimes far more exciting then than they are today!